Is a Finish Carpenter Considered to be a Cabinet Maker? Home > Cabinet Making	> Is a Finish Carpenter Considered to be a Cabinet Maker? Custom Bar Built by JL Woodworking in Sarasota Fl. My good friend Michael owns JL Woodworking and is a third generation finish carpenter. He does outstanding work and on several occasions I’ve hired him to install custom cabinet moldings. Although I have been a cabinet maker for many years, custom crown molding, natural wood baseboards and fancy trim get installed much faster and nicer when I let Michael handle the project. He is truly a master craftsman and I recommend his services without hesitation. One day I began to wonder, is a finish carpenter considered to be an expert at cabinet fabrication? As I pondered the point, several things came to mind. I think you will agree that the two professions are distinctly different. Now, please do not confuse a cabinet installer with the title of a cabinet “maker.” Finish carpenters make excellent cabinet installers and have amazing skills for building custom built-ins, but when it comes to being a cabinet maker there are tools and machines that a finish carpenter would not be familiar with. For instance, in many dedicated cabinet manufacturing shops there are sliding table saws, gigantic computerized panel saws, huge drum sanders, edge banders, hinge drilling machines, in-line boring machines, shapers, planners, conveyor lines and the list goes on. Some cupboard fabricators have tens of thousands of square feet where they turn out fine woodworking projects with amazing speed. Many years ago, when all cabinets were actually built on the job site, then finish carpenters were the cabinet makers as well. Somewhere as technology began to grow two separate professions began to form. Today, large cabinet companies use precisely accurate machines to mill all of a custom home’s kitchen, bathroom vanity or office cupboard components in the shop. Very little if any cupboard manufacturing is done on the job. High-tech facilities are set up on the 32 millimeter cabinet making system. I highly doubt that most carpenters would know what that term means. Finish carpenters work on baseboards, crown molding, customize ceilings with decorative trim, install cabinets that have been manufactured elsewhere, attach door casings, hang doors and install chair rail. You will find them scaling tall, faulted, cathedral, tiered and layered ceilings with scaffolding. They work from ladders often and have to set up a portable shop somewhere in the home or office they are working on. Although they are precisely accurate in everything that they do, in my opinion they are not considered to be “cabinet makers.” However, they have the capabilities of building nice looking cabinets. It just might take them a little longer because they will have to think things through as the go. I have seen beautiful sets of cupboards in high-end home kitchens, bathroom vanities, offices and even garages that finish-carpenters have installed. This however, does not classify them as cupboard makers but only installers. A true cabinet maker spends a life time dedicated to mastering the fine art of building beautiful cupboards and learning how to use machines designed for cupboard fabrication. 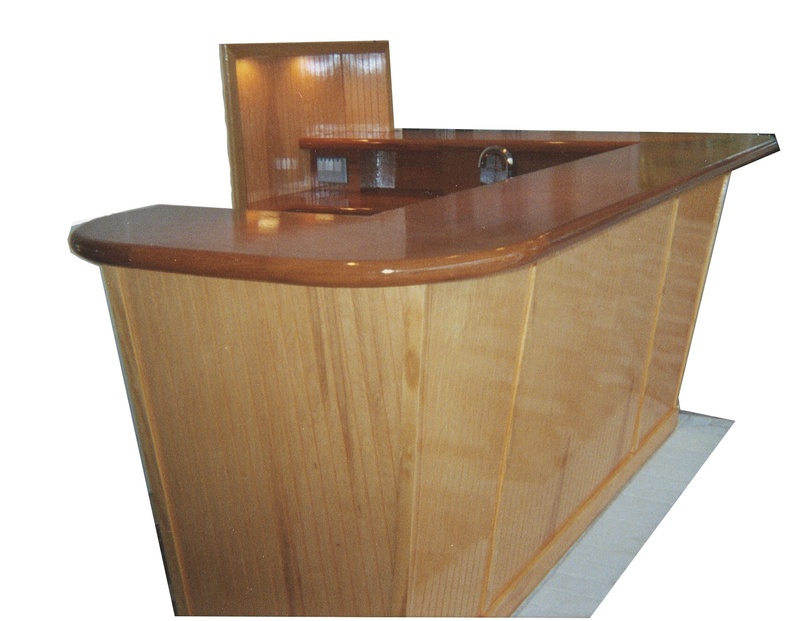 A finish carpenter dedicates a lifetime to working on the job-site most of the time and occasionally works in a cabinet makers shop or periodically fabricates a wall-unit. The two professions/occupations are entirely different yet somehow they cross each other’s paths. They seem to have a great working friendship and compliment each other well like my friend from JL Woodworking and me. Thanks for posting a photo of our cabinetry work. Finish carpenters are skilled in many differt areas of cabinetry as well as special moldings.